The Port of Virginia daily transfers millions of dollars in equipment and materials through its operations in Norfolk, Portsmouth, Newport News, Richmond and Front Royal. But with an aging workforce and a lack of truck drivers with commercial driver’s licenses (CDLs), the port needed to hire third-party drivers on a regular basis. This process can take a lot of extra time and money, said Donna Circelli, a training instructor at The Port of Virginia. To bridge this training gap, Circelli and the port reached out to Tidewater Community College’s Center for Workforce Solutions, which has offered a CDL program at its location in North Suffolk for years. 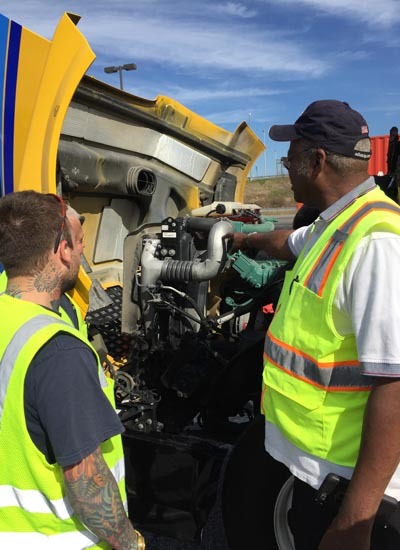 Because the need was specific to the equipment and layout of the port, Workforce Solutions customized CDL training onsite at Norfolk International Terminals. Starting in February, six students began the classroom and behind-the-wheel training to earn their CDL. These employees were chosen from specific areas of the port that need the most transportation assistance, including crane operation, facility maintenance and vehicle maintenance. class into 40 instructional hours. While several CDL licenses are available, the port needed their employees to have their Class A, which means they can drive just about anything, including vehicles weighing or towing over 26,001 pounds and vehicles carrying hazardous materials. Circelli said the employees who attended the training spent a lot of time outside the classroom studying and doing homework, as the eight-week course was condensed to approximately 40 hours of instruction. “The instructors, Wallace Miller and Matt Isaac, were great – both in the classroom and behind-the-wheel, despite it being a real ‘crash course’ for everyone,” she said. Despite the quick turnaround training, all six employees passed their CDL exams this past April and are now Class A licensed commercial drivers. Shaina Yowell, a customized training solutions specialist at TCC who was the project lead on this course, said that the program demonstrates the college’s agility in meeting employers’ needs, whether at a TCC location or a business. For more information about TCC’s customized training solutions, contact Shaina Yowell at 757-822-1164 or syowell@tcc.edu. To see all of TCC’s maritime programs, including trucking, visit www.tcc.edu/maritime.